Hey everyone — it’s good to be back (finally)! I’ve mentioned before that many of my friends (along with my wonderfully patient wife, Glynis) keep reminding me that I don’t always need to have some big, fabulous thing to show in order to create a post here. While knowing they are right, I continue to struggle with feeling a lack of anything genuinely interesting to display or speak about … then the time between these updates grows longer and longer, and all my anxieties along with it. It’s a vicious circle I am (still) determined to break, even if that means sharing something that didn’t work right, or to express a hope/frustration in a line or two. I hope your holiday celebrations were warm and wonderful, and that this year has been good for you thus far. With so much of the negative being emphasized in the world right now, it’s more important than ever to stay aware of the positive and be grateful for all that we have. Like many of you, the grinding process of working towards long-range goals can make it easy to slip into self-recrimination, allowing devastating sentiments to cloud the precious creative drive we depend upon as artists. I discovered a welcome antidote for those pernicious feelings while reading an article by one of my favorite authors, Malcolm Gladwell. A celebrated contributor to The New Yorker, Mr. Gladwell has written several fascinating — and hugely successful –books (Outliers, The Tipping Point, Blink, and most recently David and Goliath) that each had a profound effect upon me, resulting in much reflection and a renewed sense of curiosity about how things may actually work (as opposed to how we sometimes, mistakenly, think they do); his TED talks are highly recommended as well. In the article Late Bloomers, Gladwell begins with the story of a young, aspiring writer named Ben Fountain whose seemingly rapid ascent from obscurity to literary darling is revealed to have actually transpired over the space of eighteen years — most of it spent working away at his kitchen table. Although the focus of the piece is to ask why we equate genius with precocity, I found great comfort in the way he describes two different artistic personality types. Can you guess which side of the line I lean towards? 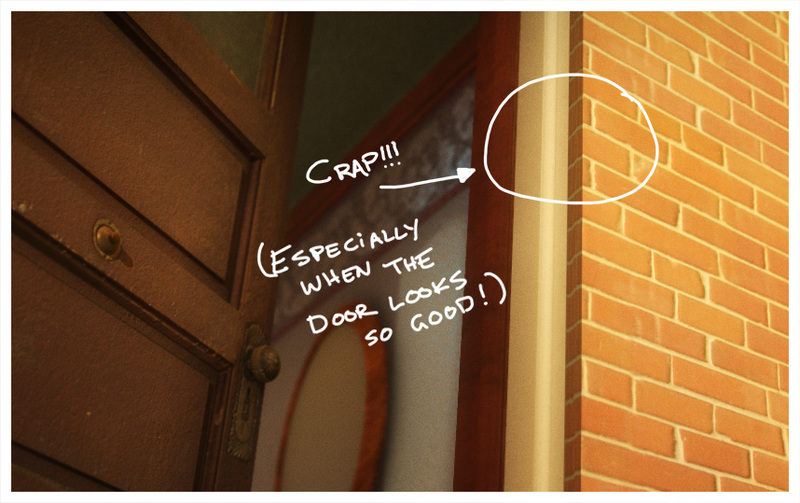 Near the beginning of the animatic (the simplified, rough-draft of the movie), I choose to introduce the audience to the narrator by having a stray cat approach the front door of his home. 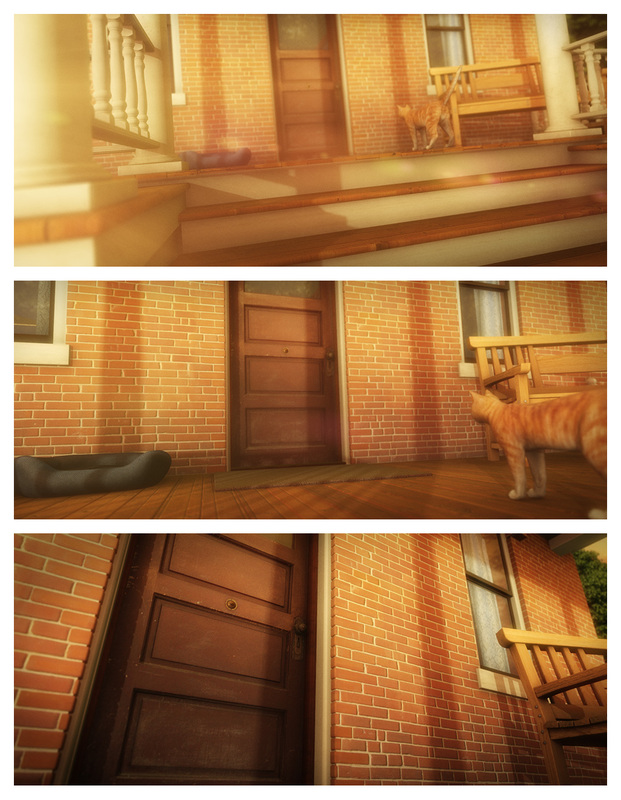 Using storyboard illustrations, this was accomplished with cuts between the feline visitor and the opening door. In the actual film where the camera is free to move about the 3D ‘set,’ I devised a more immersive shot; we glide up the steps and across the porch, past the stray, and push-in close to look up at the door as it opens (a point-of-view similar to the cat’s). I was thrilled with the effectiveness of the move, but then noticed a glaring issue … the bricks looked fake! The model of the house was made with a minimal amount of polygons, the building blocks for 3D images. Simply put, the more polygons in a given object, the more complex and realistic it may look — but the computer has to work harder to ‘draw’ or render them onscreen. With limited computing power, that becomes a vital issue. 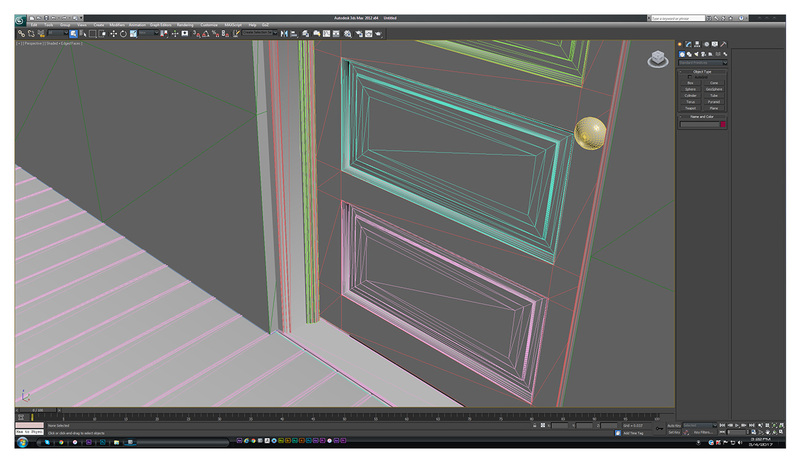 All of the brightly-colored lines in this image make up the triangular shapes of the polygons, and they act like the frame for the model of the front porch. These digital frames are covered with images called texture maps, using a technique similar to wallpapering. Below are examples of some of the textures used (many of which were made from photographs I took while visiting the legendary Castle Gaiman). To keep the poly-budget down to a reasonable level that my computer won’t choke on, many details have to be ‘faked’ with texture maps and another type called a ‘normal’ map (the name doesn’t make any sense at first, but we aren’t going to go into that right now). 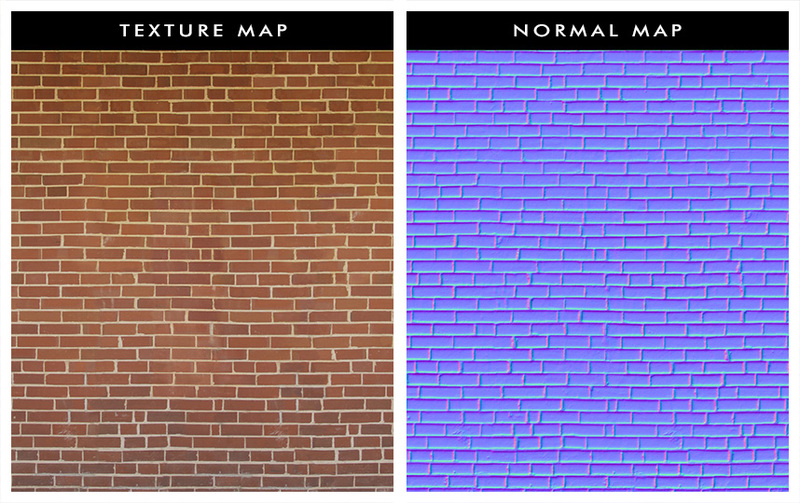 The seemingly bizarre coloration of the normal map tells the computer how to light a flat object — like a smooth, featureless wall — so it looks like rough bricks with sunken grooves of mortar. These two maps go a long way toward making it appear as though the house walls are actually made of bricks … until you get to the hard, sharp-edged corners … and the jig is up. Illusion shattered — it looks like wallpaper! While that may not seem like a big deal, by having the camera move in this close, the lack of edge detail becomes extremely distracting! The whole point of the shot is to focus anticipation on seeing who is opening the door, not the limitations of my PC, right? 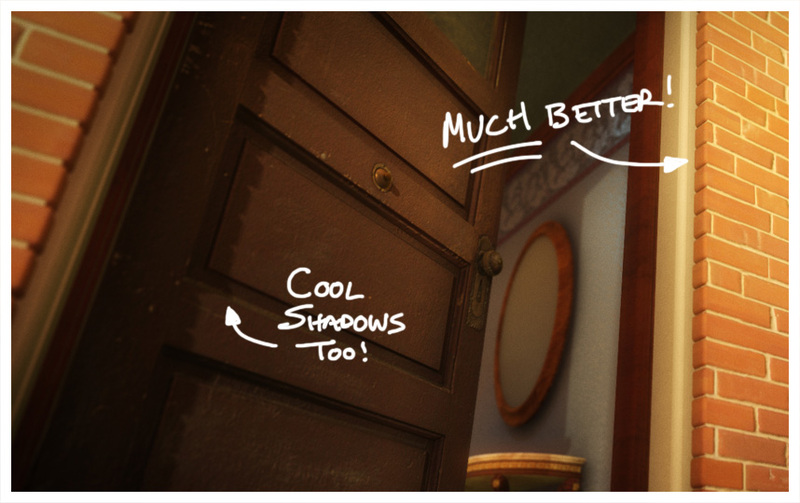 To go back and rebuild the porch walls with individually modeled (and textured) bricks would have been a huge, labor-intensive job, and defeat the purpose of keeping the assets lean in the first place, so … what to do? 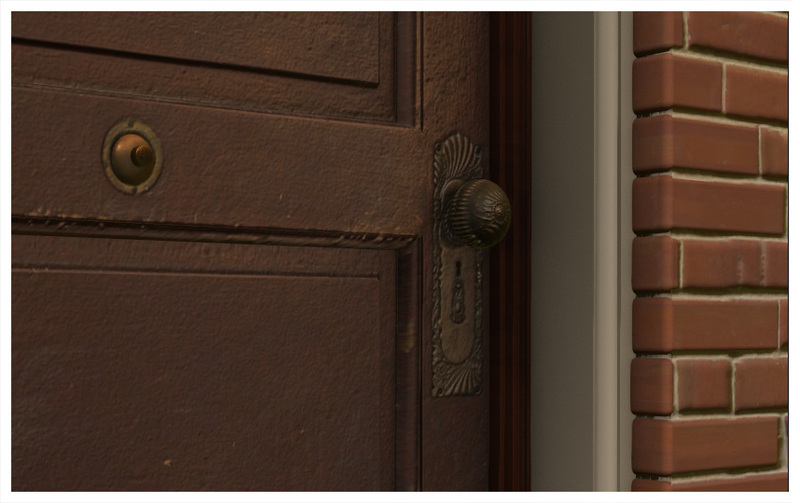 And in the final shot, those bricks even cast a shadow across the door, adding one more detail that helps keep the illusion onscreen alive. Gladwell then states the extremely vital role that patrons play in allowing these types of artists the time to be able to develop and produce their work. That brings me to all of you, and the overwhelming surge of gratitude I feel towards everyone who has believed in my vision and generously supported this project, who continue to send so much encouragement and … yes, love. I can’t say it any better than that. My deepest thanks to everyone (beginning with Mr. Neil Gaiman, my family, and to each one of you) for allowing me to make this little film, to honor a story I fell in love with and can’t get out of my mind/heart until it can be shared with the world. This entry was posted in The Price and tagged Bricks, Late Bloomers, Malcolm Gladwell. Bookmark the permalink. As difficult as the project has been, I know that you have faced some of the ultimate adversities that life can throw at us during this same timeframe, and that you have passed those rubicons with your humanity intact… and that’s a beauty that neither canvas nor symphony nor opus can match. I’m inspired by your passion and your perseverance! You’re getting plenty of love from me and the “cathouse” that we run here in New Mexico! And don’t sweat the bricks… soft worked pretty well for Cezanne! All the best to you, and yours! And I can feel that love, Tad! Thank you once again for your thoughtful comments & encouragement! Thanks for the update! I love learning about your production process, and I am happy to wait for what I know will be a fantastic film! That means a lot, Lorena; I just wish the wait was over! 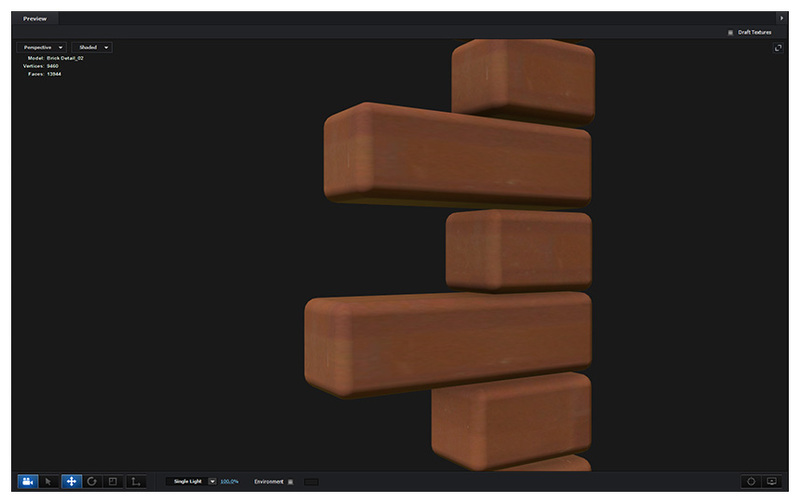 Having dabbled a bit with 3D art, I know all too well how texture maps look fake up close. Love the way you saved it, though, looks fantastic! I would have just faked it in Photoshop. But then I only do still images. Thanks Jon! There are still some Photoshop fixes in the film because of the hybrid-type of animation — basically I’ll use whatever will work for a particular shot. I empathize. Definitely feel like one of the late bloomers. I have had a respectable career in tech, but an anonymous drawn-out parallel life as an aspiring creative. So glad you remain persistent. This “little” film is your Great Pyramid of Cheops. Bricks indeed! Is there any way to unsubscribe from the updates and still be notified when the finished film is available? I’m not sure, Debbie but I’ll see what I can find out for you. I’m a late bloomer too! Published my first book in my mid-forties. Now working on a long-term (emphasis on LONG) project, obsessing over details in order to get it right. Patience, determination, sometimes being easy on yourself — all are needed. Go for it … and thanks for the updates! Wow, good for you, Martha! I appreciate the inspiring thoughts and wish you stamina, success and joy in your own pursuits — we wouldn’t be committing so much to these projects if ultimately we didn’t really enjoy creating them, would we? Thanks for the update. It’s a long process, but I am always happy to see you’re still working on it — and that the end result will be ever the better for all the time spent on it. Thanks Jordi for those constant good vibes; I’m glad you can see why I haven’t considered giving up. Listen to your wife. In my opinion, the little things are even more facinating than the big things, because I love to see the attention to detail that goes into the animation. And in the end, those lots of little things will add up to one big beautiful film. Wise words Liz! She has valuable objective insights and shares them with compassion and sensitivity (I’m very fortunate to have a best friend with that combination of qualities). I am going to get more involved in posting images on Instagram as well (some of my older kids want to give me a hand with that), so we’ll all be doing our best to get the information flowing! Thanks for the interesting update. How far in the production process are you now? 70% done? 80% done? 90% done? Thank you, Casper. I’m 100% submerged into the production process, but as for giving any sort of accurate estimate on when it’ll be finished, I can’t say, other than as soon as possible. Hang in there with me, man! An estimate doesn’t have to be accurate But fair enough. Always love to see these. Am familiar with all of this through being at least passingly familiar with a lot of game design stuff, but it’s particularly cool to see concrete examples of it in your work. Continually sending you all the goodwill I can from the California countryside. Always nice to hear from you, Christopher. That’s a good one, and one I can use right now. Thank you. Ah Trina … you make me laugh! So very nice to get a dose of pure enthusiasm like that! Thank you, thank you, thank you. Of course, you are exactly right, my friend — who wants to be defined (especially in such a broad manner)? And I so appreciate your understanding something that is hard to put into words (which is why I borrowed some of Mr. Gladwell’s). Your patience and positive energy inspire me, Lynne!!! After shivering in a dark and powerless house for the last two days it was a treat to find an update. What?! I’m glad you liked the post, Pat, but very sorry to hear about your predicament! Everything is back to normal now, I hope? We had a lot of company in the dark here in Michigan. Big winds snapped off trees and power poles cutting power to as many as 1000000 households and businesses, some for more than a week! I’m sorry to hear that “a lot people is starting to think it is a scum.” I actually wasn’t sure if you meant “scam” (as in I was trying to make people believe I have been spending years of my life making this film when really I’ve just been pretending so I can … hmmm, I’m not sure what kind of fiendish purpose that would serve), or perhaps you meant to type “scrum” (as in “scrummage,” which is, of course, a method of restarting play in rugby that involves players packing closely together with their heads down and attempting to gain possession of the ball). Either way, I’m still going to keep working away. Thanks. Xtopher, I’d join your scrum anytime. Well played, sir. (By “a lot of people” I’m guessing that was a comprehensive survey of two?). Got your back, morale-wise, cash-wise, belief-wise. Much thanks amigo! Glad for your multi-faceted support and rapier wit, Trevor! Onward indeed!!! How are u, sorry I had to change email. Keep up the great work, dont’ worry about how long it takes, enjoy the ride. I love all the updates u have posted. Don’t worry if there are no images, just enjoy hearing from ya. Thanks Dwayne — I’ll try to keep that in mind!